This marine park is the most popular attraction in town. 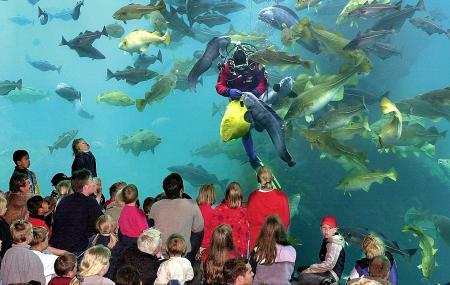 It is one of the largest saltwater aquariums in Northern Europe. With 4000 sq metres of exhibition space, it is able to house 11 large aquariums, 2 open touch pools and 2 activity pools, and a few minor aquariums. Between them, they cover practically all of Norway’s important marine life. The Great Atlantic Tank: Cod, halibut, conger and salmon. Selbukta: The world’s largest seal exhibit, outdoors. It’s a 40 minute walk from the town center. Very manageable, especially considering the charming scenery of woods, monuments, the sea and the hiking paths. It’s a nice walk. Nearby, there’s also a beach where you can go swimming or scuba diving. During summer (May – August), the Aquarium bus will leave from town hall Rådhuset, Monday-Saturday at 11, 12, 1, and 2pm. From Atlanterhavsparken the departure times are 12.15, 1.15 and 2.15pm. NOK 75 for 3-15 years old. Free for under 3 years old. Check attraction website for specific feeding times. Bus no. 614 or 618 stop Skarbøvik (ask bus driver to stop as close to park as possible). Follow signs to park. How popular is Alesund Aquarium? People normally club together The Fisheries Museum and Godoya while planning their visit to Alesund Aquarium. Every time I come to Ålesund I visit the aquarium. I always enjoy it, it is not that big but just how they managed to integrate it so perfect in the nature is already worth a visit. A marvellous place. A must see when visiting Alesund! Amazing variety of marine life and great presentation by all the employees.